Yukina Savoy is a very delicious cold tolerant cooking green. It grows in a rosette, like tatsoi, but bigger, less shiny, more blistered. 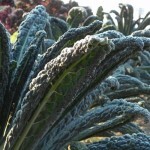 It survives down to 10°F (-12°C) outdoors, so is a good outdoor crop in late fall. Ours is doing so well this year that we started eating outer leaves in early October, planning to eat more later. We eat from the outdoor crop from mid-October until mid-December. Outdoors, we transplant them 12″ (30 cm) apart. We have also transplanted some in our hoophouse (sown 9/15) to feed us in December and January. A second sowing (9/24) will feed us in January and February. It is fast-growing in the fall, taking 21 days to reach baby size, 45 days to full size. The plants grow quite large, we transplant them at 10.5″ (26 cm) apart. They grow 12″ (30 cm) tall. In the spring (which comes early indoors) Yukina Savoy has the advantage of being somewhat heat-tolerant – it doesn’t bolt until the middle of March in there. Of course, we aim to have eaten it all before they get a chance to bolt. For commercial sales, the whole plants are cut, gathered and fastened with a tie. For home use, you have the option of simply taking the leaves you want for immediate use, and letting the heart of the plant continue to make more growth. The photo to the left shows the open-pollinated variety we used to buy from Fedco Seeds, but sadly they no longer have that. Instead we bought a hybrid Koji from Johnnys Selected Seeds. Koji claims to be “attractive, upright, and earlier maturing than Yukina Savoy, which it replaced.” I think the “more upright” and possibly the “earlier maturing” parts are true. Attraction is in the eye of the beholder. I think Koji is less cold-hardy and less blistered than the OP type, shinier, and with greener stems. 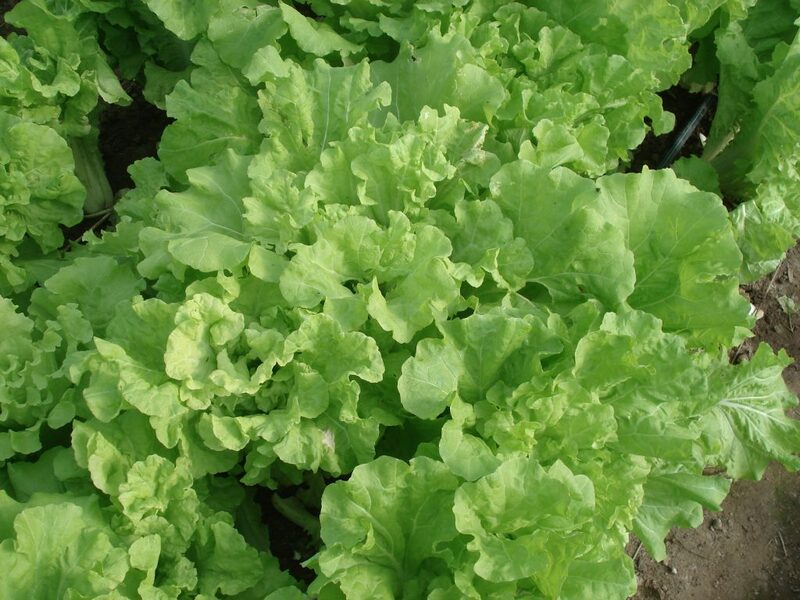 I’ve found the OP one at Kitazawa Seeds, where it is classified as Chinese cabbage, loose head type. It’s a Brassica Rapa Pekinensis Group, for those considering saving seed. The only photo of the Koji fully grown that we have is here on the left. This one is bolting, so it’s not a totally fair comparison. Both types are delicious, and easy to cook. 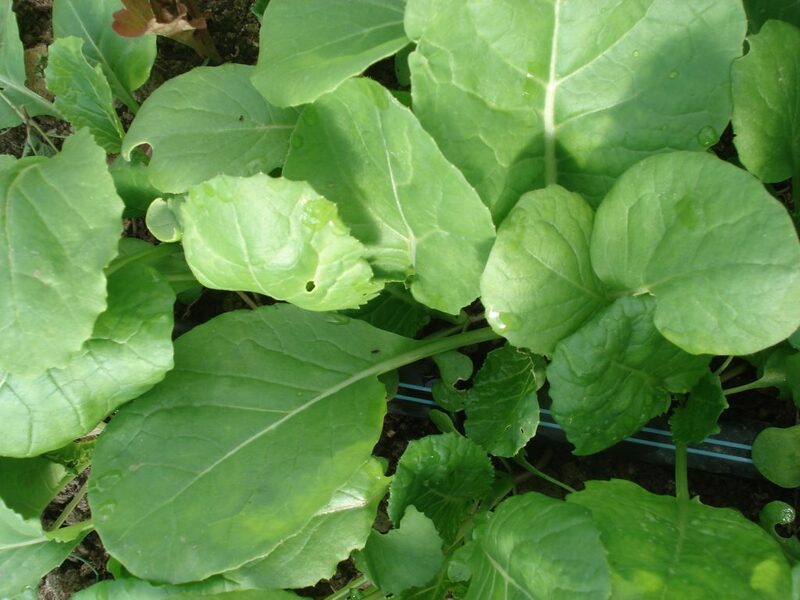 We had been including Yukina Savoy in our hoophouse bed which has nematodes, thinking it is Brassica Juncea, which has some resistance to root knot nematodes. Back to the drawing board, on that plan! 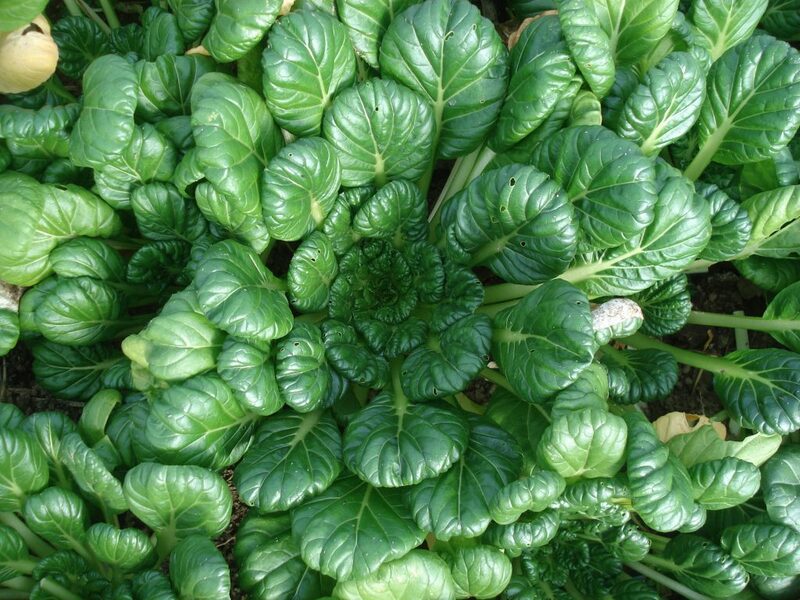 Tatsoi is a smaller, shiny dark-green leafed plant with whiter stems. The leaves are sometimes described as “spoon-shaped” – the white stem is the spoon handle and the leaf blade is the bowl of the spoon. The plant grows as a flat rosette if it has plenty of space, but more upright if crowded as in the photo above. The flavor is milder than Yukina Savoy. In the fall, it takes 21 days for baby salads; 45 days for cooking. We don’t plant tatsoi in spring, as it would bolt before growing in our “Instant Summer” climate. 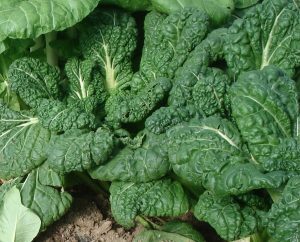 Tatsoi is also very cold-tolerant, similarly hardy to 10°F (–12°C). We no longer grow this one outdoors, because Yukina Savoy is bigger and easier. We prefer our small plants be in the hoophouse, where there are almost no weeds, and we don’t mind spending longer harvesting in winter. (More tatsoi per bucketful than Yukina Savoy = more time). We direct sow in the hoophouse on Sept 6, one of our first fall hoophouse sowings. We sow rows 6″ apart, knowing they will get crowded. 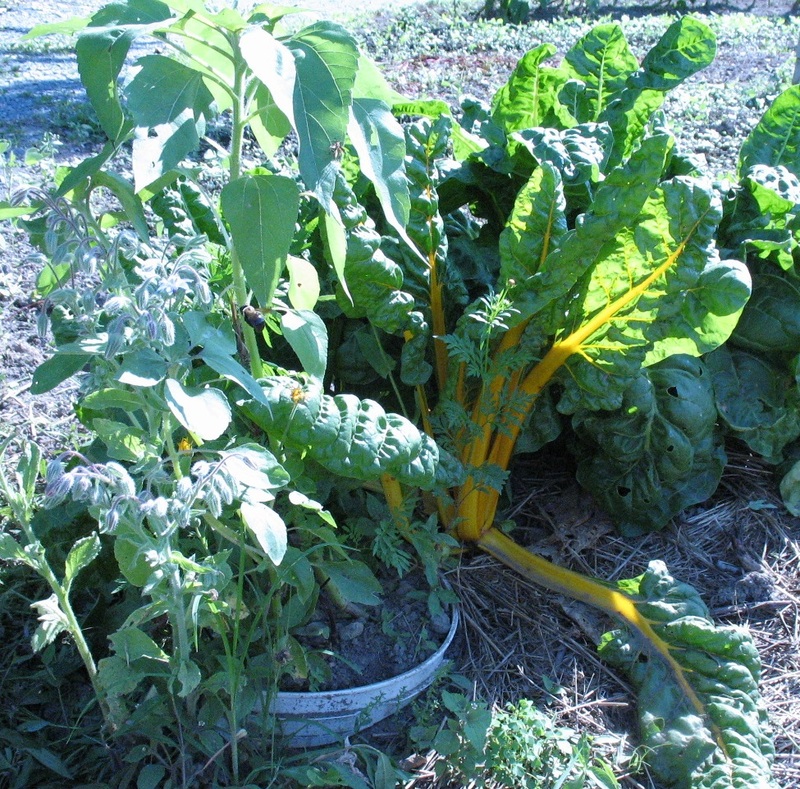 We thin into salad mixes, leaving some plants to mature at 10″ (25 cm) across for cooking greens. Tatsoi also transplants easily – I’d probably go for 6″ (15 cm) spacing if transplanting. The first sowing feeds us from 10/20 – 12/31, with thinnings for salad from Oct 8. We make a second hoophouse sowing on November 15. This one takes 8 days to germinate. It will feed us from 2/12-3/12 (thinnings 12/27-1/21). 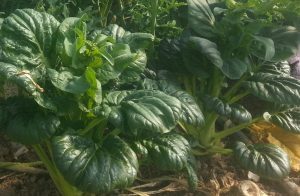 So, altogether, we have full size tatsoi to harvest from October 25 – March 5. We usually either thin out the plants, or cut outer leaves until we see the plants are about to bolt, then cut heads. Kitazawa Seeds have a Red Tatsoi, a Red Violet tatsoi/pak choy hybrid, with an upright habit, and several tatsoi crosses, such as Misome (a fairly recent hybrid between Komatsuna and Tatsoi); Da Cheong Chae (with qualities of both Tatsoi and Pak Choi); Choho (one of several hybrids of Komatsuna and Tatsoi); and Savoy Tatsoi (dark green, heavily savoyed leaves with pale green petioles, giving it a spinach-like appearance). 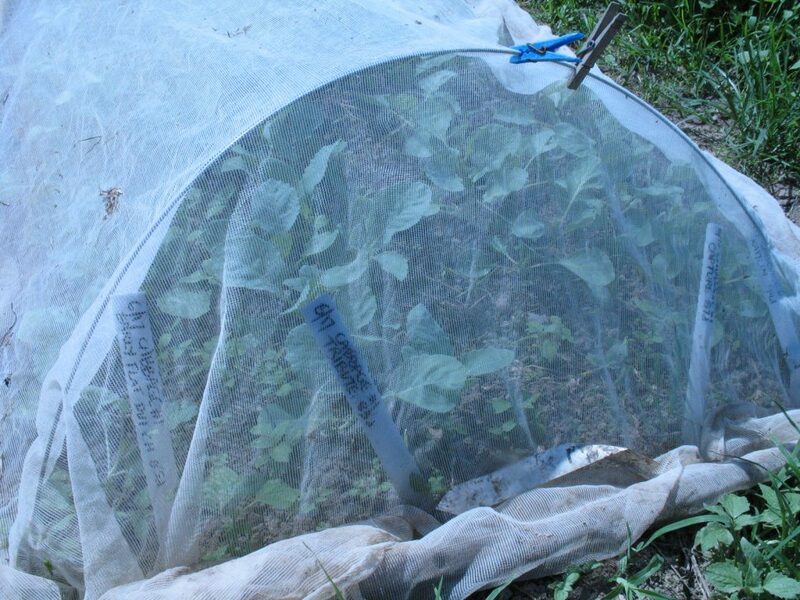 Brassica seedlings under insect netting. In late June and early July, we sow nursery beds of brassicas for transplanting outdoors. In the photo above, the plants at this end of the bed are cabbages, but in the same bed there are also Asian greens for fall and early winter harvests. We cover the beds with ProtekNet, which I already told you about in my Asian Greens for July post. We sow the seeds about 3/inch, sowing about a foot of nursery bed row for each 12-15 feet of final crop row we want. And we sow twice, a week apart, to cover contingencies like poor germination or needing to replace casualties a week later. We transplant them three weeks after sowing, at the end of July or in early August. 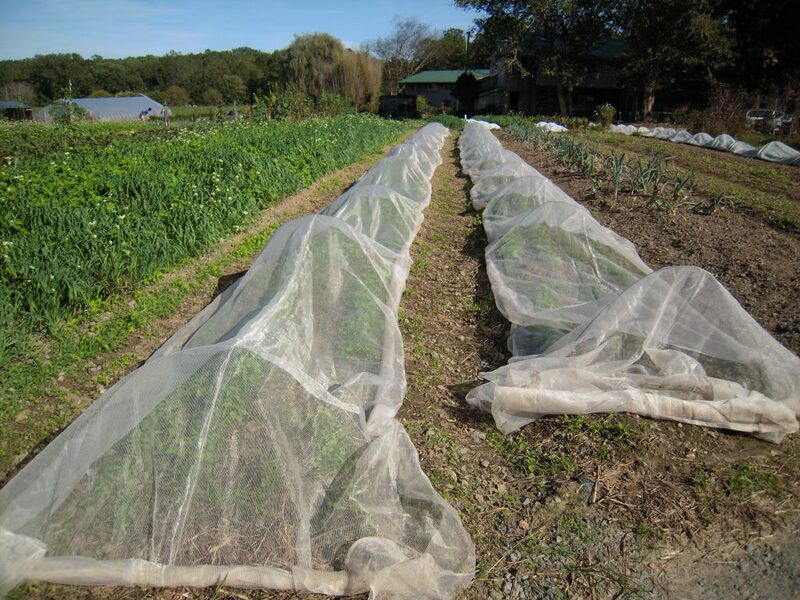 Brassica beds covered with ProtekNet insect netting. We cover the beds of transplants with more ProtekNet, for the first month. This is part of our strategy for dealing with harlequin bugs. We try to have August be “No Visible Brassicas Month” – we remove the old spring brassicas, or till them under, and we keep all new brassicas under cover. We hope that a month or more with no food (except cleomes) will stymie the harlequin bugs lifecycle. 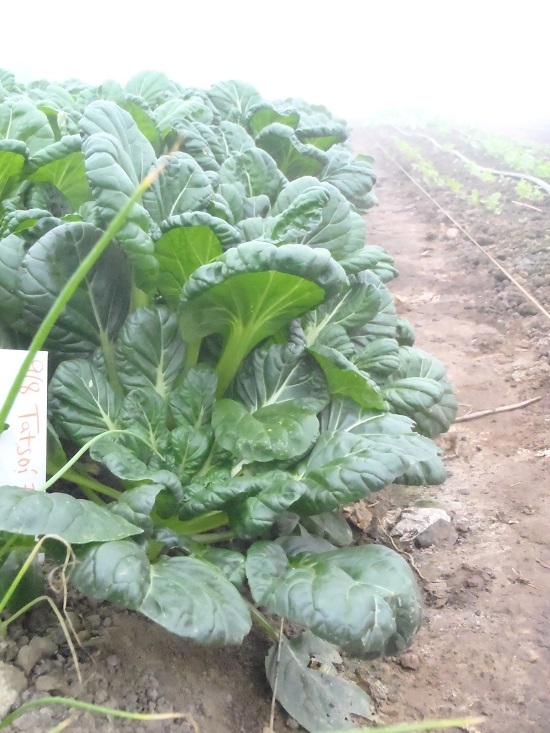 We grow Yukina Savoy for harvests from mid-October to mid-November (more on that in November), and senposai for harvests from August 20 to November. Any day now we can start harvesting senposai! Both these crops get followed by a supply from the hoophouse (more on that in late winter). For fall harvests, sensposai is ready a mere 40 days from sowing, or 10 days longer if you disturbed it and transplanted, as we do. Depending on your winter climate zone, you may have time to sow for growing in a hoophouse (zone 6 or warmer), or outdoors (zone 8?). If you had a cabbage disaster, try fast-growing senposai. An outdoor bed of young Senposai. Senposai leaves are cold-tolerant down to 12F (-11C), and the core of the plant may survive 10F (-12C). 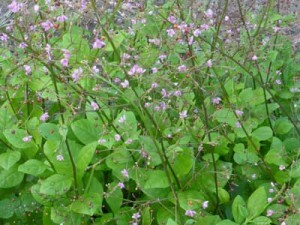 Young plants can be used for salads. In June I told you about Tokyo Bekana, a light green tender-leaved, white-stemmed green which can be cooked, or used as a substitute for lettuce in hot weather. Because summer in Virginia is a hard time for leafy greens, July’s Asian green is very similar – Maruba Santoh. Maruba Santoh has smoother, wavy, less ruffled leaves than Tokyo Bekana. Maruba Santoh (35 days) Brassica rapa (pekinensis group) Open pollinated. With Maruba you get four vegetables in one. The loose round vibrant chartreuse leaves provide a mild piquant mustardy flavor while the flat white stems impart a juicy crisp pac choy taste. High-end chefs like to use the blossoms. 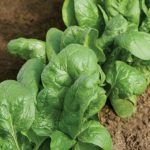 Market grower Scott Howell finds the flavor more subtle and complex than that of other greens and cuts Maruba small for his mesclun. Fairly bolt tolerant, so plant after the early spring flea beetle invasion subsides. Fedco is in Maine and we’re in Virginia, so things are a little different. The information on their website about pests and diseases is good. 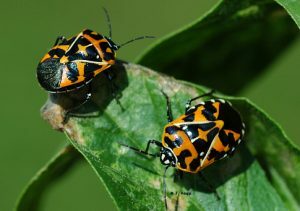 Our worst brassica pests are harlequin bugs. 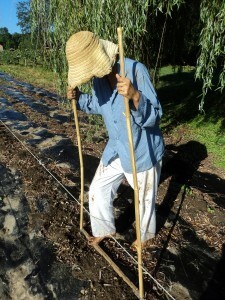 We grow our summer brassica seedlings and transplanted Asian greens under ProtekNet on hoops. On the Dubois link, study the Dimensions and Specifications tab, then download the brochure from that tab. Study the Descriptions tab – it tells you which insects are excluded by each size mesh. Be sure that you choose the right size mesh for the bugs you want to exclude. Flea beetles and thrips are small – you need a small mesh. Johnny’s is now marketing the close-mesh ProtekNet as “Biothrips” insect netting, and they also have a comparison chart of rowcover and insect netting on their site. Adolescent Maruba Santoh plants bunched for market. Kitazawa Seeds also sells Maruba Santoh seed, under the Chinese Cabbage heading. Like most brassicas, Maruba Santoh does best in cool weather, although it is somewhat heat tolerant (or “warm tolerant” as we call it in Virginia.) It tolerates heat better than Napa Chinese cabbage does. To avoid bolting, keep the plants above 50F (10C) at all times, but particularly avoid prolonged spells below this “bolting trigger” temperature. Maruba Santoh will germinate at temperatures between 50-85F. Seedlings emerge in just 3 days in summer. For summer use, direct sow, thin the rows for baby salad mix, then let the “heads” (it doesn’t actually head up) develop to full size (6-10″ tall) after about 35-40 days. Or transplant two week old starts. 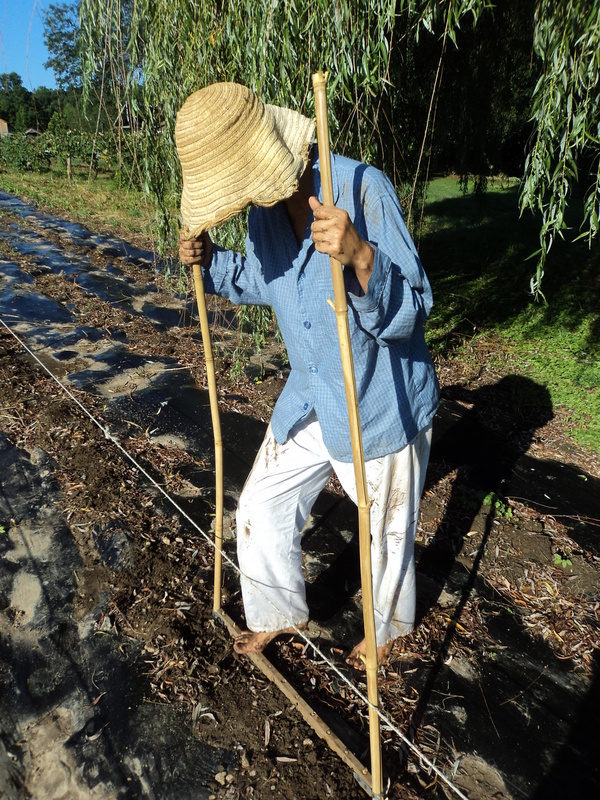 We tend to grow our plants quite big (12″ tall) and harvest by the leaf, several times over. Maruba Santoh makes a fine substitute for lettuce, and a tasty quick-cooking green. To calculate sowing dates, work back 40 days from when you want to harvest, and sow more every week or two until you run into the fall slowdown temperatures, or you go back to eating lettuce in salads and cooking chard and kale. If you still have Maruba Santoh growing in the fall, know that it will be frost tolerant to 25°F (-4°C). No hurry. Maruba Santoh can also be grown at other times of year: spring and fall outdoors, winter in the hoophouse. The seedlings have large cotyledons and make good microgreens too. Next month I will talk more about Asian greens outdoors in fall. Now is the time to sow for fall harvests. We start in late June, and sow more in early July. We always make two sowings a week apart, for insurance. 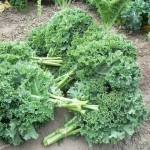 We are aiming for greens to feed us in early fall, before the kale is ready, and into the winter, harvesting by the leaf. 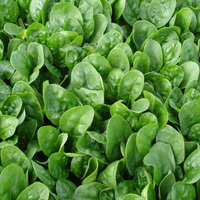 But Asian greens can be sown all the way up to two months before your first fall frost date. For us, that means August 14-20. 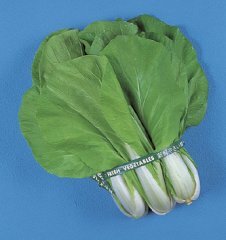 If you want to make sowings now, consider senposai, komatsuna, pak choy, tat soi, Yukina Savoy, and Chinese cabbage. An insectary circle with borage and sunflower in a chard bed. 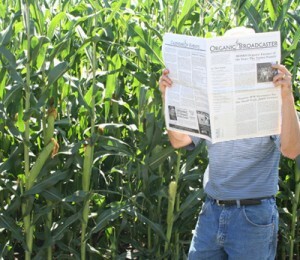 I have two posts on the Mother Earth News Organic Gardening Blog that I haven’t told you about yet. So if it’s too hot out, or it’s raining (don’t make me envious) seek shade and read more. The newer post is Insectaries: Grow Flowers to Attract Beneficial Insects, and the previous one is Planting Leeks. 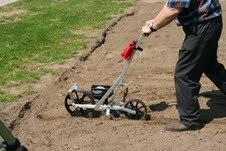 I planned to write about making use of soil test results and deciding what soil amendments are needed. But I haven’t got to grips with the task enough to say anything helpful yet! So instead I’ll write about what we are actually doing today. Today we sowed our first beans.I soaked the seeds overnight for about 13 or 14 hours. The goal is to get the seeds plumped up but not to split the bean skins. 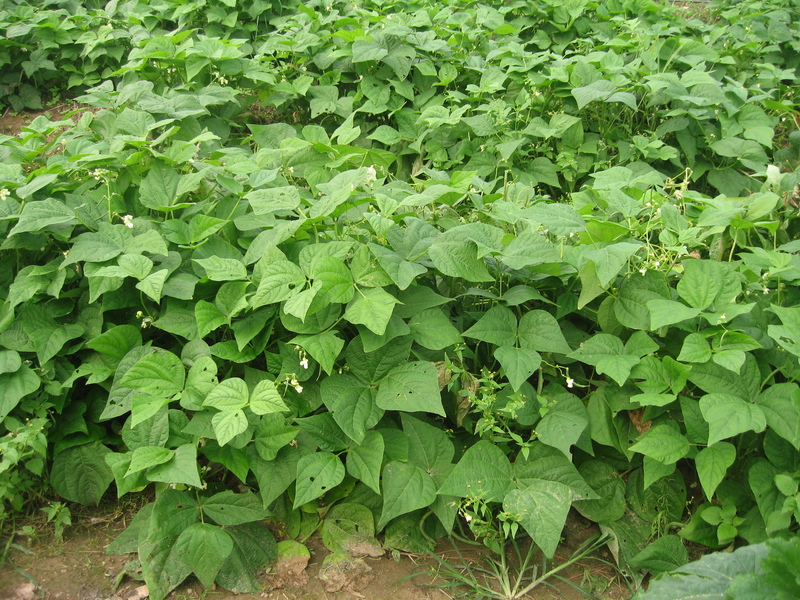 We like Provider bush beans for reliably fast results, even in the early part of the season. They are purple-seeded, so they are better at emerging from cold soils than the white-seeded varieties. An open-pollinated variety, they take only 50 days from seed to harvest. I make that June 14! 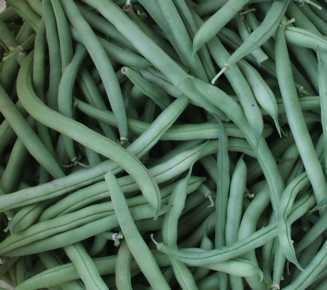 Looking forward to eating green beans. We follow the old wisdom to wait till the oak leaves are the size of squirrels’ ears before sowing beans. We have plenty of oak trees and plenty of squirrels! Today the white oak leaves are a little bigger than squirrels’ ears, but the red oak leaves are smaller. Another phenology sign I look for is for the lilac to be in full bloom. The lilac got messed up this spring. It was half-blooming when we got a two very cold nights – 20F on the night of Saturday 4/9 and 22F on Tuesday 4/12. The lilac florets got frozen. The rest of the florets have now opened. I guess it would be full bloom, if half the bloom hadn’t got blasted! The same phenology signs apply to corn, but that’s a task for tomorrow. When we plant beans in our 4ft raised beds, we put two rows in the bed, about 16″ apart. When we sow them in our row crops area we put up a rope and sow a row either side of the rope, so the rows are only 6″ apart. Both ways work. 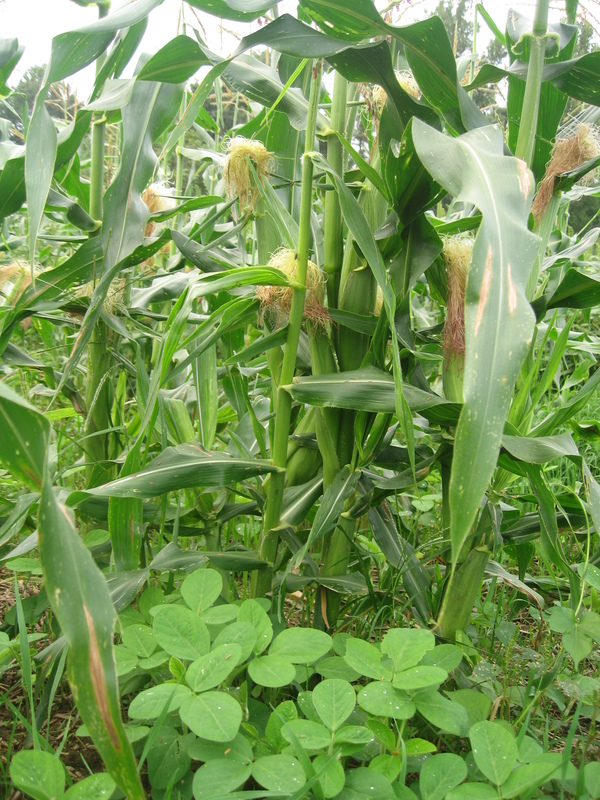 You can read more about growing beans in my book Sustainable Market Farming. Click the About the Book tab. We have also sown beans into (through) biodegradable black plastic. Initially we did this by using two long dowels (one in each hand) to poke holes through the plastic. Next we went back and pushed a bean in each hole and smushed the soil over the bean under the plastic. 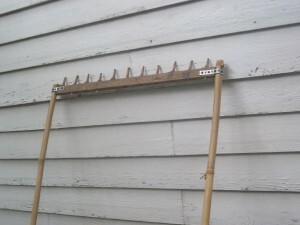 We upgraded by making a multiple seed dibble (sowing jig). 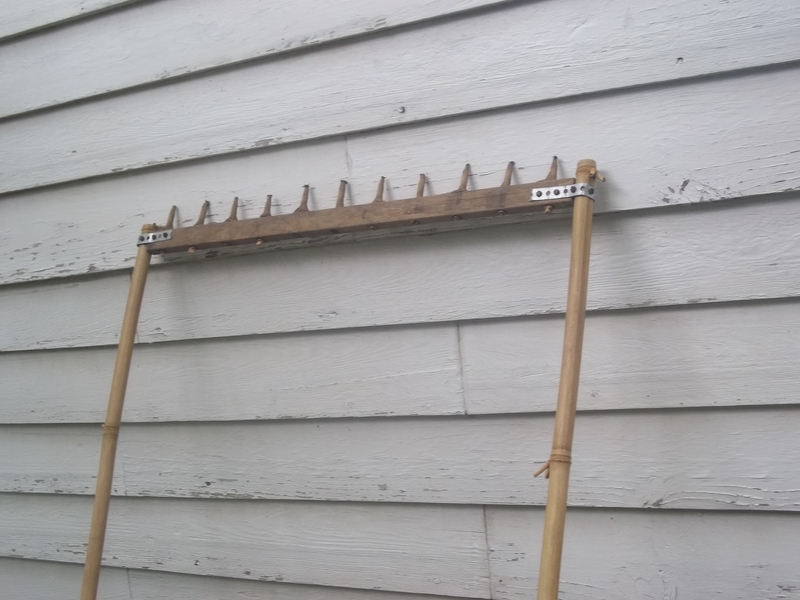 It’s got two long handles made from home-grown bamboo, a cull hammock stretcher bar from our hammocks business, and a set of dowel pegs hammered into the holes the ropes would go through in a hammock spreader. bar in normal life. We were able to use an commercial pencil sharpener to put points on the pegs.The bean planting dibble is held together by two lengths of metal strapping tape as you can see in the photo. Using the bean dibble to plant through plastic mulch. To use this, after we have installed the drip tape and the biodegradable plastic, we put a stake in the ground at each end of the row and run a rope from end to end to keep us aligned. Then we go along each side of the rope, stepping on the dibble to make a set of holes about 3″ from the rope. 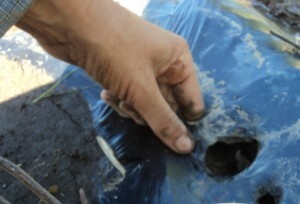 In this photo, the row happens to be on the overlap of two widths of black plastic, so what you can see is the soil which is holding the edges of the plastic down. Planting beans through holes in biodegradable plastic mulch. 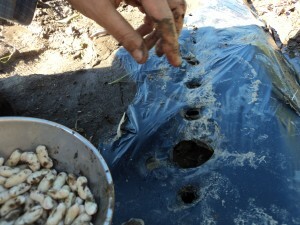 Then we sprinkle inoculant on the drained, soaked beans, and poke one in each hole. You can read more about the benefits of adding the nitrogen-fixing bacteria as an inoculant when sowing peas and beans at the Planet Natural site. We keep our inoculant in a plastic jar in the fridge and just sprinkle a little of the black powder on the damp beans before planting. You don’t need a lot. I tell the crew to imagine they are putting pepper on their dinner. We just use our finger to push a little soil over the bean seed. I’m not sure if this is even necessary, or if the hole would fill in by itself. The beans have no trouble finding their way out of the holes in the plastic. Plants only need to see a glimpse of daylight to know which way to head. The pictures all look cool and muddy. This method can be quite fast, although not as fast as sowing in open soil. The time-saving comes later, when there are almost no weeds to deal with! Pushing soil over the bean through a hole in the biodegradable plastic. We also add a few sunflower seeds to each row of beans we plant. Sunflowers attract beneficial insects and birds, and provide attractive landmarks in our gardens. When someone asks where are the beans to pick, we point them to the sunflowers. When we are harvesting a long row with lots of people we can use the sunflowers as start and stop markers. In our fertile soil with ample irrigation, the beans do not suffer any competition from the sunflowers. If your soil is marginal or you don’t have a good supply of irrigation water, you might not want to try this at home. Sunflowers in our vegetable garden. 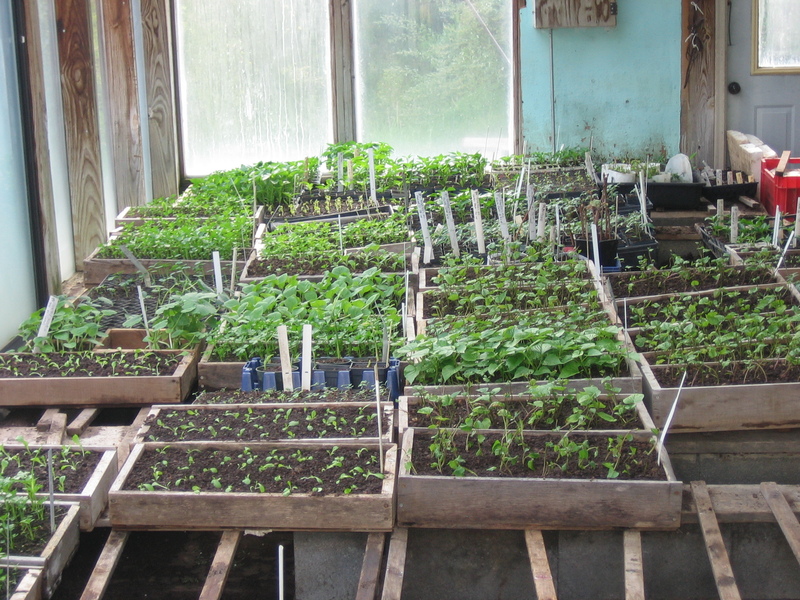 Where we’re headed – our greenhouse with flats of seedlings. Today is our day for sowing the first broccoli, and also the celery. This year we are trying Redventure celery from Fedco Seeds. We’re hoping Twin Oakers will like the red color and still find it tender enough for their palates.This spring we are growing five broccoli varieties with varying days to maturity, so we can get a long season. We also do two broccoli sowings two weeks apart, to further extend the season. We’re growing Tendergreen (47 days from transplanting), Green Magic (57 days), Green King (65 days), Arcadia ( 68 days) and Diplomat (also 68 days). Green Magic and Green King are fairly new to us. The others are tried and tested here. Our hoophouse tomatoes have already germinated, and are in a plastic tent on a seed heating mat by the greenhouse windows. We have the 48″ x 20″ size, and later we’ll extend the plastic tent and graduate the older seedlings off the mat, but still under the tent for extra protection. Also germinated, but getting no special coddling, are lettuce, cabbage, scallions, cipollini, more cabbage, spinach and collards. Sown, but not yet germinated are the hoophouse peppers, some kale and senposai. 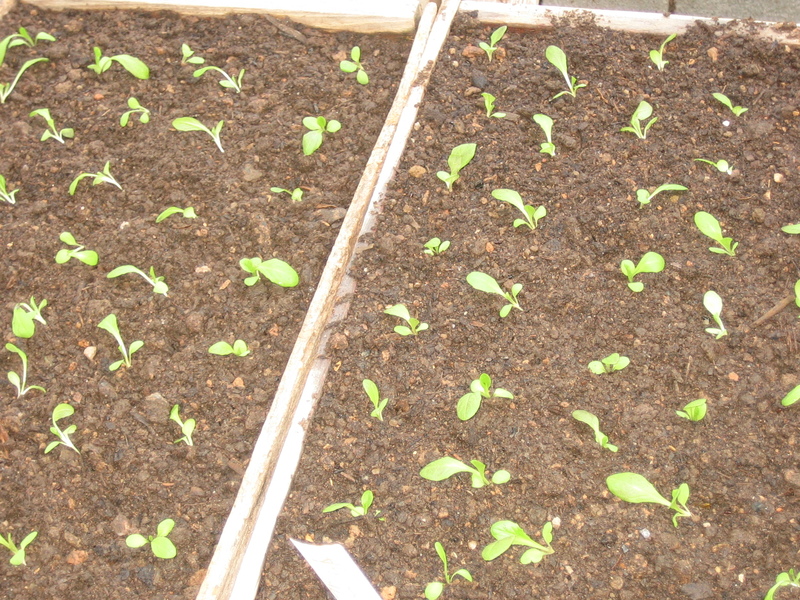 Where we’re at now: Flats of spotted out lettuce seedlings. Many of you are finding your way to our Twin Oaks Month-by-month Garden Task List without special help. It’s my goal when I have more time to make a permanent link to useful lists and charts from our garden on my website. One day. . . Here in central Virginia, we have no snow, just flurries of icy stuff that isn’t settling. This past weekend, though, I was up in State College, Pennsylvania, where they had piles of old snow. We were lucky with the weather at the conference and on our travel days. The PASA Farming for the Future Conference was a lot of fun and very inspiring. I don’t know how many were there. I did a rough count of chairs when Frances Moore Lappe was speaking and got to 1500. I gave two workshops: Cold-hardy Winter Vegetables and Growing Great Garlic. Both went well and had about 70 participants. The bookstore sold 18 copies of my book, and I also signed other copies that people brought with them. Rhino Technologies made sound recordings of the workshops for sale, and they will soon be available via their website. My slideshows are available to view at SlideShare.net, so if you weren’t able to get to the conference, you can still catch up! I also got the chance to go to some great workshops by other people too. Clara Coleman from Four Season Farm Consulting gave an inspiring presentation on the Latest Innovations in Four-season vegetable production from a Maine perspective. Yes, she is a daughter of Eliot Coleman, a great pioneer in extending the seasons growing vegetables sustainably. I love getting new ideas, and it’s also useful to me to be able to compare growing in different climate zones, so I don’t say something silly when someone asks me about growing a crop, and I forget Maine is not Virginia! I also enjoyed Lee Reich‘s presentation on No-Till Vegetables. 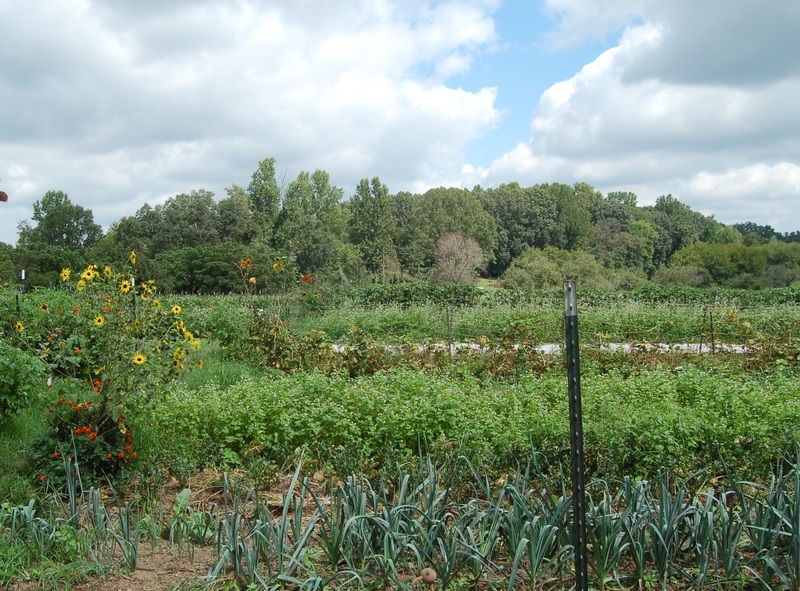 Mostly for homestead scale gardens, but including photos from a a nearby farm using the same principles. I got a lot of inspiration from Klaas and Mary-Howell Martens‘ workshop on Finding Your Cover Crop Repertoire. I’ve heard them speak before, and I know they have a wealth of carefully-observed information and a clear way of explaining how to put it into practice. At this conference I didn’t go the workshops by Jean-Martin Fortier, even though they are so inspiring. It’s always great to meet him at events, and I did eat dinner with him, and exchange progress reports in the elevator one day. There are 3 pre-conference workshops (4 to 7 hours each) on Thursday, for $60-$75: Essential Tools & Techniques for the Small Scale Organic Vegetable Growers by Jean-Martin Fortier of The Market Gardener fame, Urban Farming Intensive with Cashawn Myer & Tenisio Seanima, and Edible Landscaping with Michael Judd and Ira Wallace (of Southern Exposure fame). 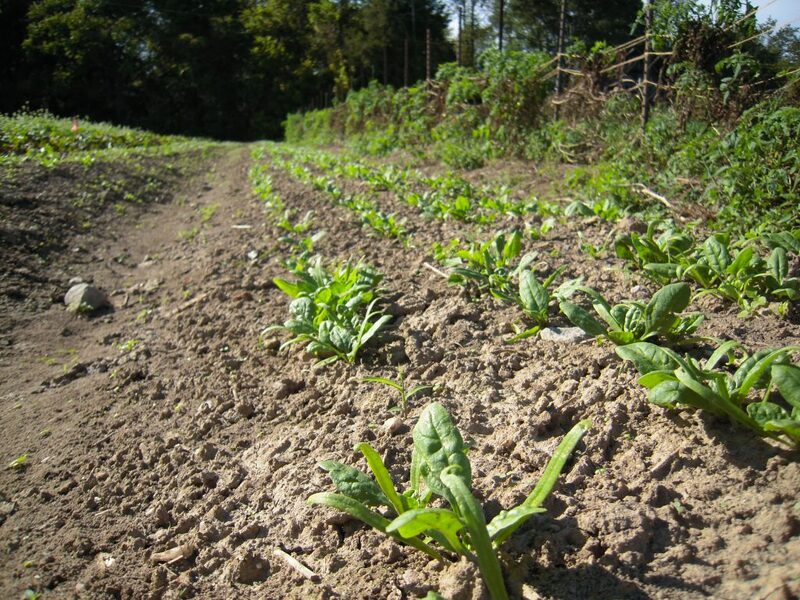 I’m giving two workshops: Succession Planting for Continuous Vegetable Harvests – How to plan sowing dates for continuous supplies of popular summer crops, such as beans, squash, cucumbers, edamame and sweet corn, as well as year round lettuce. Using these planning strategies can help avoid gluts and shortages (3pm Friday); and Producing Asian Greens – Detailed information for market and home growers. 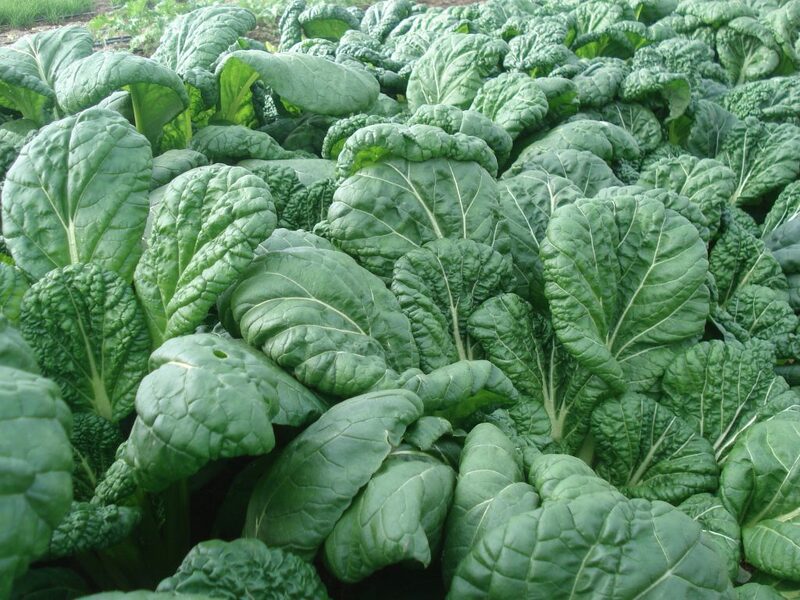 Many varieties of tasty, nutritious greens grow quickly and bring fast returns. This session covers production of Asian greens outdoors and in the hoophouse. It includes tips on variety selection of over twenty types of Asian greens; timing of plantings; pest and disease management; fertility; weed management and harvesting (10.30 am Saturday). I’ll also be signing and selling books. Bring a dish for the Friday potluck picnic at lunchtime, seeds for the seed swap, a notebook and two pens, a bag to collect handouts and so on, and if you play music, bring an instrument and some songs for the jam on Friday night. Then the next weekend, I’m at the Pennsylvania Association for Sustainable Agriculture Farming for a Future Conference February 4-7, 2015, at State College, PA. There are extra pre-conference sessions on Tuesday 3rd and Wednesday 4th, then the main conference on Thursday, Friday and Saturday. I am speaking on Growing Great Garlic (Saturday 3.10 pm) and also on Cold-hardy Winter Vegetables (Friday 8.30 am). I also hope to be doing book-signing and sales. February 26-28, 2015 I will be speaking at the West Virginia Small Farms Conference in Charleston, WV. That workshop will either be Cold-hardy Winter Vegetables, or Succession Planting for Continuous Vegetable Harvests. 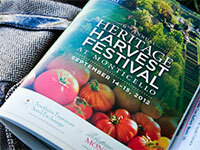 The fourth booking I have is at the Heritage Harvest Festival at Monticello September 11-12, 2015. Too soon to name the topic. 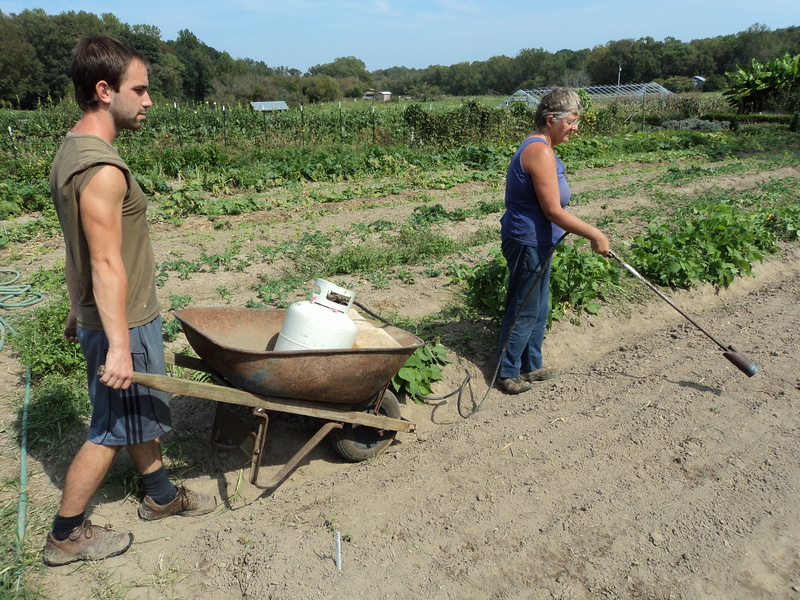 And meanwhile, this week on the farm we finished our seed ordering and started some shopping for tools and supplies. In 2015 we will repeat our variety trials to try to find a heat-tolerant eggplant variety. We were happy to find another Batavian heat-tolerant lettuce to try: Carioca from Johnny’s. 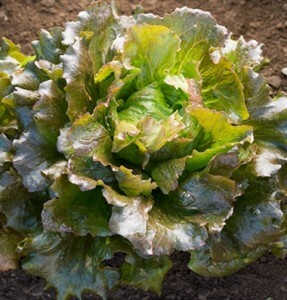 With the addition of a few exceptions, we rely on Batavian lettuce varieties once the weather gets hot, to grow without bolting or getting (very) bitter. the exceptions are Jericho green romaine, De Morges Braun and New Red Fire, a looseleaf red lettuce which nearby grower Gary Scott told me about. We are also growing some Eden Gem melons alongside our Kansas and Sun Jewel melons (and the individual-serving size Tasty Bites that I mentioned in my last post. We have high hopes for Peacework sweet pepper from Fedco, a very early (65 day) OP medium-thick-walled pepper “with good flavor and full-bodied sweetness.” We are always on the look-out for fast-ripening bell peppers. Because of the seed-growing business at Twin Oaks, at the end of the season we have tons of ripe peppers, but if you are growing a seed crop, there is no incentive to try to push the planting date early. So our main pepper-focus in the vegetable garden is on earliness and flavor – never forget the importance of flavor! We are also trying Donkey spinach this year. For years we have been very happy with the reliable performance and productivity of Tyee, but Fedco tell us the producer of Tyee is a Multinational engaged in genetic engineering. If Donkey can replace Tyee we’ll be very happy! Our hoophouse bursting with winter greens. The weather is chilly and grey, so I’m happy not to have to spend long outdoors. 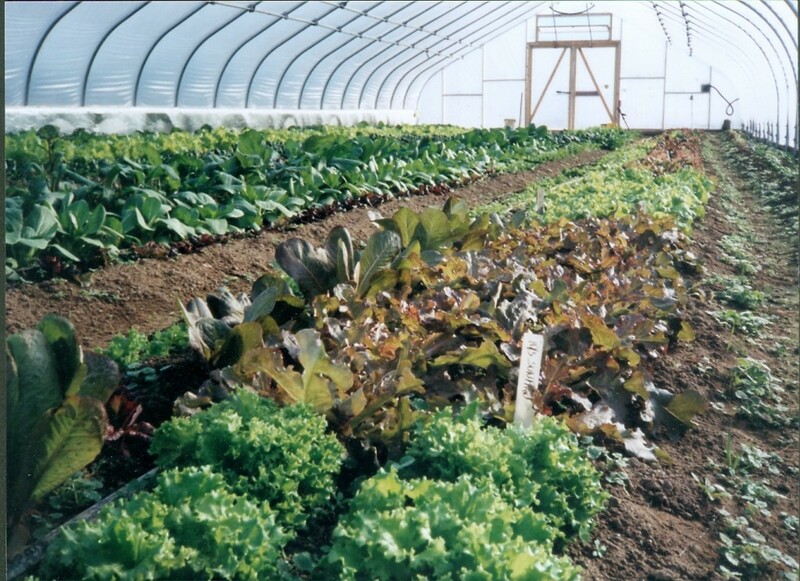 The hoophouse is bursting with greens, and I’ll harvest in there after lunch, to avoid nitrate accumulation in the leaves, which is highest first thing in the morning..
We’ve been working on our seed orders. We start by weighing and making an inventory of the seeds we have left over. We check the dates on the packets too, and write off the ones too old to be vigorous next year. We throw our discarded seeds into an Old Seeds Bucket, and we have several ways of using old seeds. 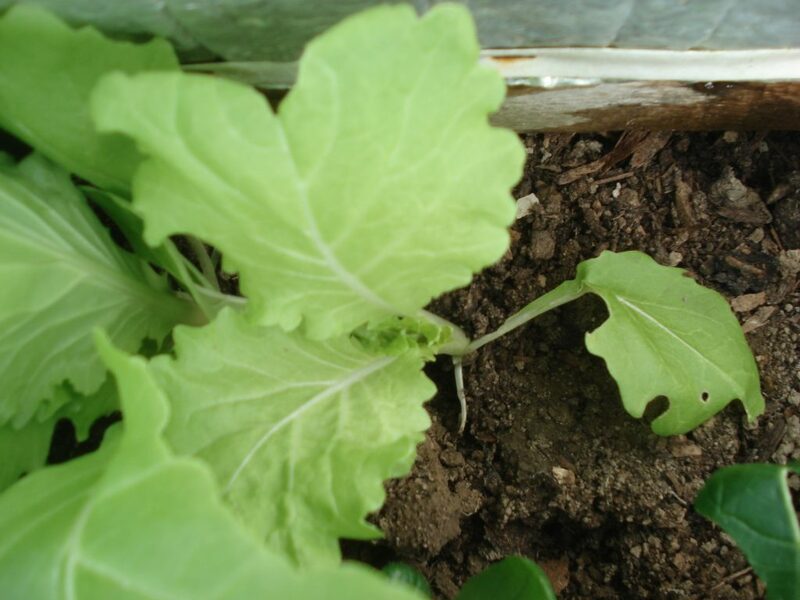 For instance, if we have a short-term space in the hoophouse in winter, we make a mix of brassica seeds and sow a baby salad mix. We have also made mixes of old seeds to use for cover crops outdoors. And we’ve retrieved seeds when we’ve had a germination issue with a sowing. We sow the old seeds alongside the poorly germinated ones, and order some new seed. When the new seed arrives, we might sow that, or if the old seed has come up OK, we’ll save the new seed for next time. We use spreadsheets for our seed inventory and seed order, and we use the seed inventory to make the seed order, so we can see at a glance how much we need to order. It helps us buy enough seed, but not too much. buying too much either leads to wasting money (if we throw it away) or wasting time and money (if we sow old seed that doesn’t come up well, then have a crop failure). We do the seed ordering as a small group exercise, with the perk that each crew member who participates gets to choose an “impulse-grow”! It could be a couple of tomato plants of a new variety or 120 feet of a direct sown crop. I’m hoping to try individual serving sized melons. I championed the idea of growing some Babybeats in the hoophouse. I had to trade away a sowing of radishes, but it will be worth it! 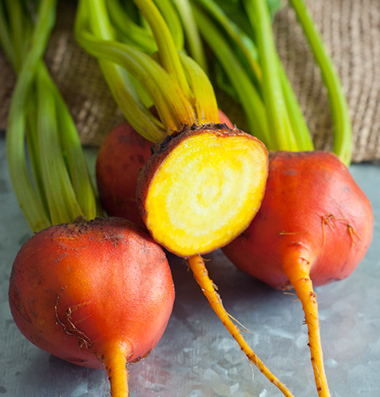 Babybeat takes only 40 days to grow (a little bit longer than radishes), and produces a small round or top-shaped beet as well as nice small beet greens. This year radishes have gone out of favor, and we don’t have many beets in winter storage, so early spring beets will be appreciated. We also make some group decisions on new crops. We decided to try Royal Burgundy beans in our hoophouse, where we do an early sowing, and want a variety that is easy to pick.We noted “Grows well even in cold conditions. Light brown seed ” in the description. White-seeded beans don’t germinate as well in cold conditions. Next year we are trying a couple of rows of Boldor golden beets. Unusual color vegetables are not always liked by our cooks – we’ll see how it goes. We are also trying some carrots other than orange: Yellowstone and Atomic Red. Our dissatisfaction with the cabbage varieties we have tried for winter storage is leading us to try Storage No. 4 again. Because our long-time favorite Ventura celery isn’t available, we are planning to try Redventure celery next year. 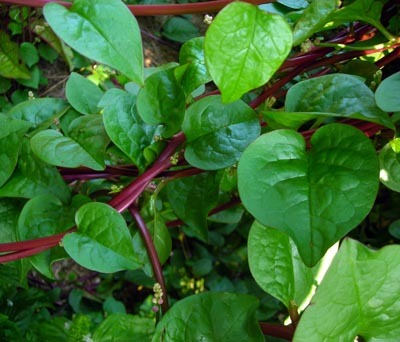 Malabar Spinach, a summer green leafy crop. Credit Southern Exposure Seed Exchange. 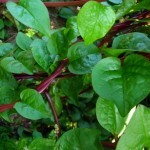 And we are trying Red Malabar Spinach next year, on a tall trellis next to the asparagus beans. We freed up the space by deciding not to grow parsnips, which we have lost to weeds at least two years running, now. Meanwhile, the catalog from Southern Exposure Seed Exchange has arrived. They have some interesting new varieties and crops. 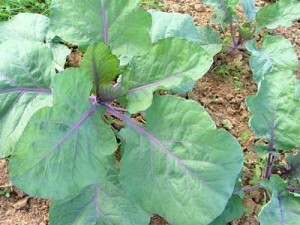 Alabama Blue collards look beautiful: plum-colored veins in blue-green leaves. And a crop I’ve never seen before : Jewels of Opar, a salad green (and ornamental) related to purslane. All this talk of varieties new -to-us doesn’t give you any ideas about our tried-and-true favorites, but if you look in the catalogs from Fedco Seeds, Southern Exposure Seed Exchange and Johnny’s Selected Seeds, you’ll find most of them. 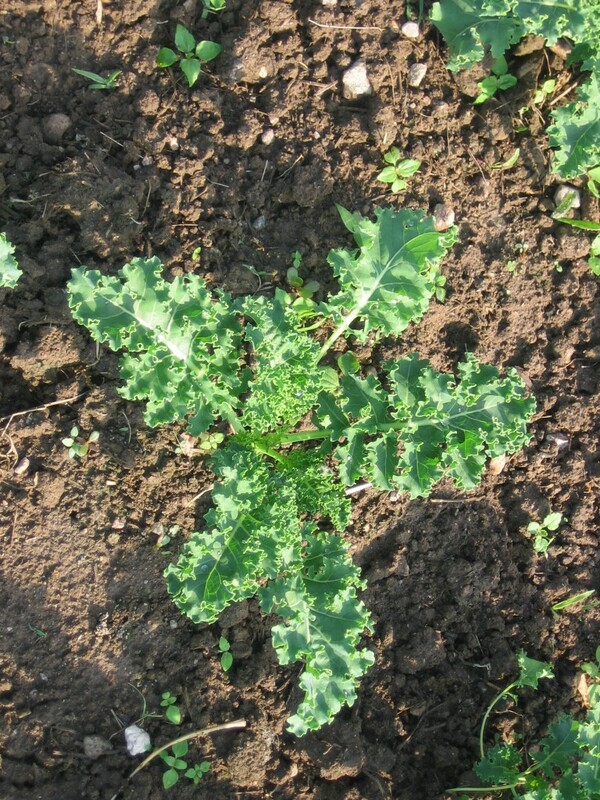 This is what we’re aiming for – healthy kale plants to feed us during the winter! I reported last week that we had got one bed of kale sown. It’s up nicely under the rowcover, so we can use some of those plants as transplants to get more beds established when we do manage to get more beds tilled and prepped. 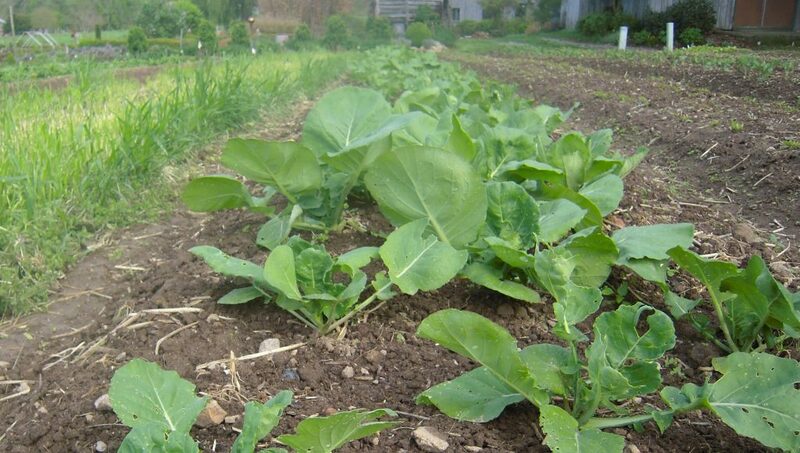 Yesterday we sowed more kale – three partial beds which had held our fall broccoli and cabbage transplants. We have at last got our final row of cabbage planted out, so the nursery seed beds are fairly emptied out. Not entirely though. Our next transplanting job is to fill gaps in the rows. We have 8 rows of broccoli and 4 of cabbage, 265 ft long. A hundred people eat a lot of food! Meanwhile, we raked around the remaining broccoli and cabbage transplants, and sowed more kale. A bit chaotic, having beds with big old plants and freshly sown ones, but manageable. all are covered with spring steel hoops and ProtekNet insect exclusion netting made by Dubois Agrinovation., which I have raved about previously. It keeps Harlequin bugs and flea beetles out. 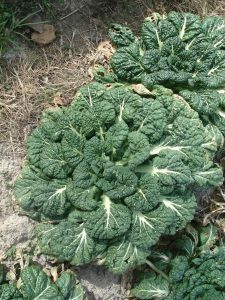 We like Vates as it’s the most cold-hardy kale we’ve found and we can leave it outdoors without protection in our zone 7 winter and harvest from it about once a week. One year we did try covering it with floating row cover, to boost production, but it was a sad mistake! The fibers of the polypro row-cover got snagged in the frilled crinkled leaves, which made the cooks very unhappy! It was faster growing than Vates, and the leaves are wavy rather than frilled, and some people liked a change from our usual. Rated as hardy to zone 5, it wasn’t as cold-hardy as Vates in our garden. We are growing some more this winter. We had planned to try Blue Ridge kale from Osborne Seeds, but they had sold out by the time I tried to order. 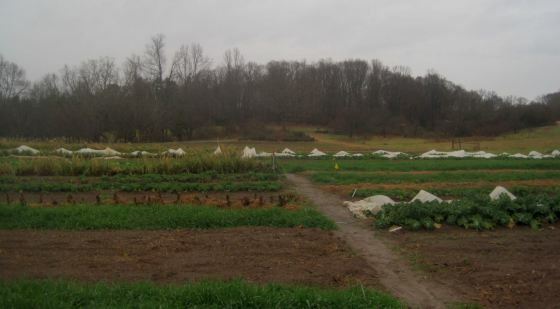 It has done well for Clif Slade at his 43560 Project at Virginia State University, where the climate is a little milder. While shopping, I bought some Black Magic kale. 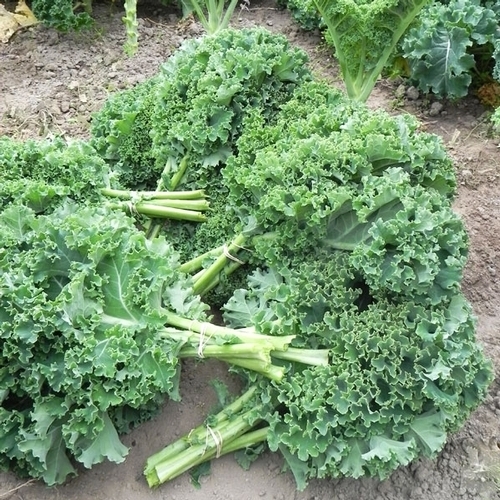 We have tried these Lacinato kales in the past, both outdoors and in the hoophouse, without much success. We’ve had aphids building huge colonies in the curled back leaf edges. We’ve had indifferent growth. I’ve tasted great Lacinato kales at friends’ houses, outside our region. But every few years it come time to try a previous failure again, and we have some new crew members enthusiastic about this one, so we’re giving it our best! Two weeks ago I asked if anyone knew if zipper spiders ate hornworms. I did some reading, and I think it’s possible they do. The Latin name for these spiders is Argiope aurantia. I found out that all the many, many zipper spiders I’ve been looking at are females. The males look quite nondescript. I also confirmed that the 3/4″ brownish sacs we had hanging all over the hoophouse all last winter were indeed egg sacs of the zipper spider. Each one held over a thousand eggs! Golly! This is better than science fiction! Wikipedia says prey can include not only insects, but also small vertebrates such as geckos, so it seems likely that hornworms could be on the menu. Does anyone have a good source of information? There’s a YouTube of a spider eating a hornworm. I haven’t got enough bandwidth to watch it. Let me know if it’s good. 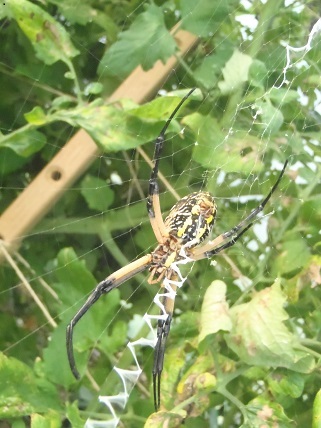 Zipper spider on tomato plant. Sowing beets, radishes and kale, transplanting cabbage. 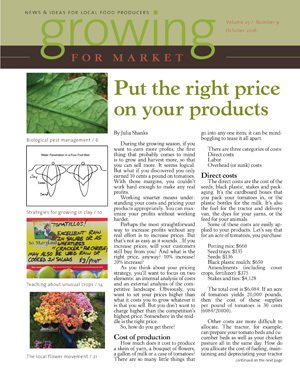 In line with my advice in the August issue of Growing for Market magazine, we are working on our First Chance to start again with the spring and fall crops. We sowed beets, and I found out I meant to order more seed before this point. In spring we sowed our beets with the Earthway seeder, rather than our more usual manual sowing of lightly soaked seed. I was working on my own and rain was approaching, so I just used the seeder with dry seed. 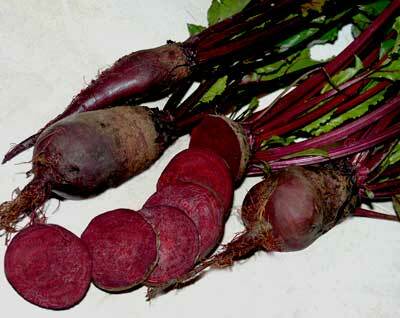 The radish plate was best for the Cylindra beets, if I remember right. Consequently I used more seed. We’ve managed to sow of the three beds we intended. I put in a hasty online order to Fedco. After clicking Send I remembered we need more carrot seed too. Argh! Happily the people at Fedco are so helpful that they agreed to my email request to add carrot seed to the order. We love buying from Fedco. They don’t waste our money on glossy catalogs. They offer great bulk discounts. And the newsprint catalog is full of pithy comments on food politics. Fedco is one of the main three seed companies we buy from – along with Johnny’s and Southern Exposure Seed Exchange. We did have enough carrot seed to complete our large fall planting (3 beds of five rows at 265′ – almost 4000ft). But we want to try a slightly later bed of carrots to overwinter. It worked well last year – the voles stayed away. Last August I blogged about fall carrot planting in my post Risking zombie carrots. The year before we ended up not managing to weed all our fall carrots, so we mowed them for weed control, then left them overwinter. We were able to harvest them in the early spring. Today we sowed winter radish and two beds of Vates kale. Next up are turnips and more kale. We sow two beds every four days until we have enough established. The rain today is perfect. I think the first two beds should have no problem germinating. The rain will also help the big carrot planting. I have been running a sprinkler overnight on them, but it takes five nights to get all the way to the bottom of the patch. And one night the well meter stopped working and it stopped the water running. So that night was a loss as far as irrigation went. We did the pre-emergence flame-weeding of the carrot beds on Saturday, thinking they might germinate Monday (and no-one wanted that flaming job on Sunday), but in fact they only started germinating this morning. Our evening transplanting shifts have gone very well. If it isn’t raining too hard this evening, we should be able to finish tonight. That’s a mere ten shifts. Sometimes it takes us a lot longer. The unknown is how much time we’ll need to spend replacing casualties, but I think 3 evenings max. We have run the drip irrigation every evening while we are working there, and some more on dry days. We’ve had some rain too, which helps. I haven’t had a thorough look under the rowcovers, but there are shadowy green things in most of the right places, so I’m optimistic. The peculiarly mild temperatures have made transplanting the overgrown plants easier than it could have been. Feels like we are making up for lost time. 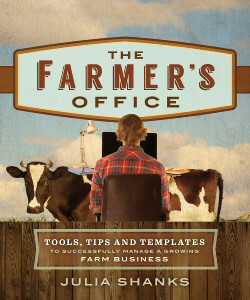 Author farmerpamPosted on August 6, 2013 Categories This week in the gardenTags Cylindra beets, drip irrigation, EarthWay seeder, evening transplanting, fall carrot sowing, fall crops, Fedco Seeds, great bulk discounts on seeds from Fedco, irrigation, Johnny, kale, ordering seeds, pre-emergent flame-weeding, radishes, rowcover, seed catalogs, Southern Exposure Seed Exchange (VA), sowing beets, sprinklers, transplanting cabbage, Vates dwarf Scotch curled kale, weather, winter radish1 Comment on Sowing beets, radishes and kale, transplanting cabbage.